Of all types of cotton sarees woven in India, the Mangalgiri cotton sarees are quite unique in their look and design. Traditionally, these sarees are handcrafted in Mangalagiri in Andhra Pradesh. These sarees are woven in pit looms and then dyed to create the stunning end look. Though woven from cotton, these sarees come with varying features, such as Zari work on borders or no designs on the body of the Saree. Browse through our gorgeous collection of Mangalgiri cotton sarees on Craftsvilla. These sarees have a fine woven texture in bold and vibrant colours. The designs on the sarees are quite delicate and distinctive giving it a crisp finish. These beautiful sarees are made by weaving combed yarn on pit looms using the wrap and weft interlacing technique. Then the sarees are dyed with bleach for white colour and vat dyes for other colours. The cotton sarees are perfect in all seasons as the soft cotton fabrics is quite durable and long lasting. Traditionally, the Mangalgiri cotton sarees were plain sarees with a border. The border of these sarees is an exclusive pattern made with golden thread which is known as the Nizam design. To keep in pace with the fashion trends, now Mangalgiri cotton sarees are woven in a single colour with pattern and border in a different colour. The number of border patterns and designs are extensive. 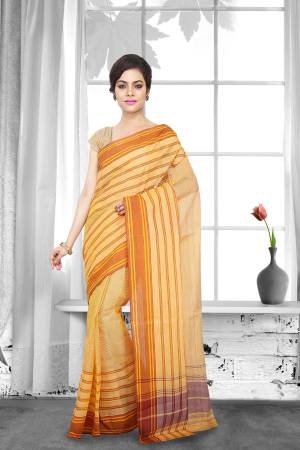 You can also find sarees with shining Zari borders that add a touch of extravagance to the overall look. 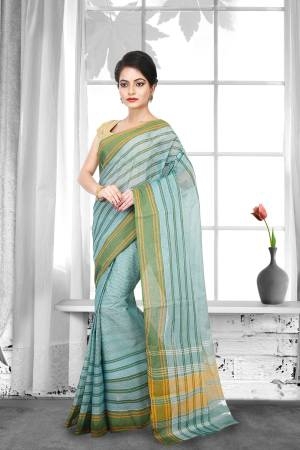 Another popular choice among these sarees is the prominent colourful stripes running across the pleats section of the sarees. 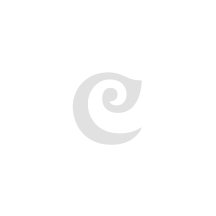 On Craftsvilla, you can find these cotton sarees in the latest designs. If you prefer to go with the striped saree, then wear a blouse in a solid colour similar to the dominant colour of the stripes. You can pair this saree with dangling earrings and a matching choker. For sarees with gold Zari work, wear blouse in the same shade of gold and match it up with simple gold or golden jewellery. For sarees with patterns, wear a designer blouse in the same shade as the pattern. Boat neck line or halter neck line blouses suit these sarees. Wear matching jewellery to enhance your overall look. Look no further than Craftsvilla to find Mangalgiri cotton sarees at affordable prices with a variety of patterns.